Today was a week full of emotion. Ups and downs, lefts and rights and then the sudden stop. So come along with me as I tell you all about it. We started out with great momentum. Plants were being transplanted into the garden. Soil was being hoed and tilled for seed planting. Both Jason and I were busy writing our books and preparing for the Homesteaders of America conference. Our recipes from our followers were turning out great. Work at the granite shed was going good. And then I got a notification on my phone. To my surprise, there was Jason jumping and hollering with a cheesy Kool Aid grin. (I had the audio muted) My curiosity got the best of me so I turned it on. Jason and Blaze had been out in the garden and saw one of our honeybees start to swarm (here come the ups). So they captured the whole thing on a live feed (which unfortunately didn’t convert over to a video on Youtube) The excitement was contagious. We were going to have another honeybee hive to add to our apiary. So later that evening, we went to check on the new swarm to find that they were dead (here comes the downs). The bee vacuum had not been calibrated (for lack of a better term) and the bees were crushed as they hit the cage inside the shop vac bucket. To say that this was heartbreaking would be an understatement. But we learned from our mistake and then shared with everyone, in an attempt to help anyone else who might be prone to make the same mistake. Then the week started chugging along again. More plants in the ground, seeds starting to break ground. Then Jason had the great idea to change around the school house (turn to the left). SO books got boxed and the seed starting shelves got moved. Desk set up and Big Bear Banner hung on the back wall. Our school house had now become our office and production room. Only one chore left in the week, that really should have been quick: changing the breaks on the mail Jeep (sharp turn to the right). Of course, I don’t know all the technical terms. But here is my best rendition of what happened. Jason pulled the tires off and realized there was more wrong then he originally thought. He thought he had all the tools he needed. Well, when he started getting to the root of the problem, it was evident that he needed a specialty tool. 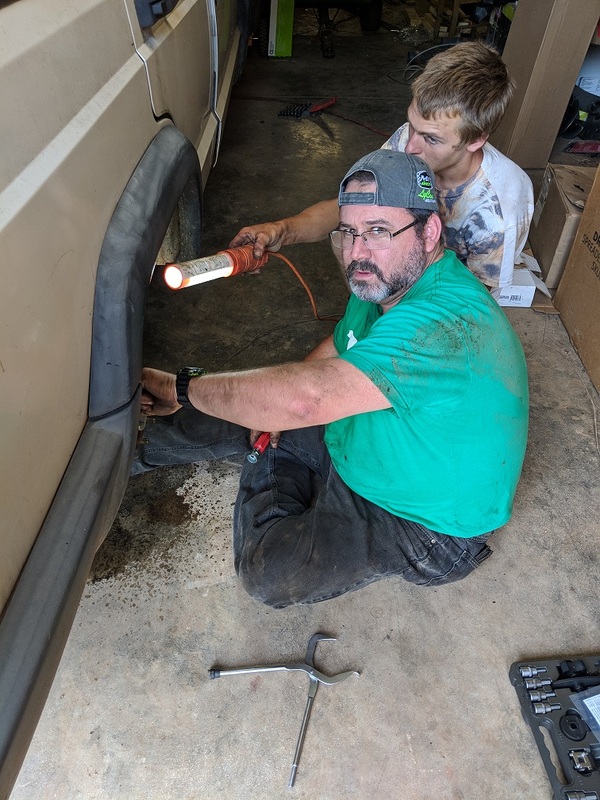 After chasing all over God’s creation (well only to Anderson and back), Jason messaged me and asked if I would quickly have the specialty tool shipped to the house. So then all forward progress hit the brakes (sudden stop, pardon the pun I couldn’t resist) The part came in on Friday with plenty of time to finish. That is if you have the right parts….You guessed it. The people at the auto store gave him the wrong size. So he went back to exchange sizes. Came back home to put the right piece on only to find that now the driver side needed fixing too. Oh and another part was also the wrong size. So back to the auto part store we went when I got home from work. It wasn’t until late Friday evening that the Jeep work was done. A little too close to Saturday morning mail route for my liking. So today, I spent most of my morning close to the phone in case I got a call that his brakes were out again. Be sure to check back next week and follow our weekly progress through all of our social media outlets. This entry was tagged bee swarm, bee vacuum, Beekeeping, SEED STARTING. Bookmark the permalink. ← Rain, rain, GO AWAY! !